There is an Isabelle KAL going on in the Tri'Coterie group at the moment and I promised the girls some better photos showing how I laced/ribboned my shawls, so here it is. 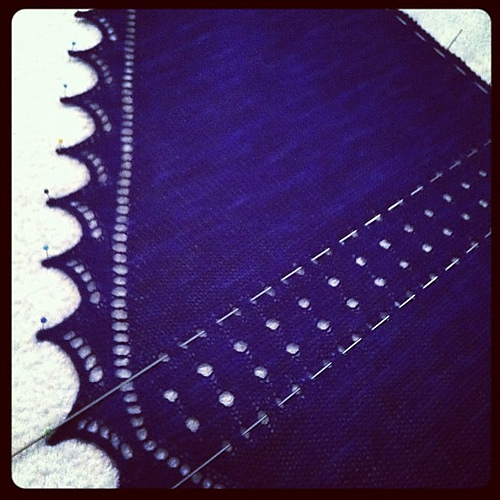 First up, the lovely Sarah took this great photo of her shawl blocking. It is really important you block this design HARD. The edging is stocking stitch and it curls under as you knit it - it really needs to be stretched out when you block it. Blocking wires are really a good investment. I bought might from a welding supplies shop for $2 (stainless steel 1-2mm TIG wires) so they also dont need to be expensive to do the job. Now you will be taking this ribbon down the middle panel. Use the column of small (single yo) holes sitting between the purl ridges. Step 4: Repeat the same in/out running stitch style lacing that you did along the top edge till you get to the bottom. Step 6: At the bottom of the shawl thread your ribbon end through to the right side. Later you will tie these in a bow with your thicker ribbon. Step 7: Repeat for the other side of the shawl using another length of 7mm ribbon. Step 8: With your thicker ribbon (about 15mm width) thread it through the larger (double yo) holes that run down the middle of the shawl. On the front side of the shawl criss cross it over, corset style. On the back it should look like running stitch again. Step 9: When you get to the bottom run the ribbon through to the front side. You may have to loop it round the back of the last hole to do this. Tie in a bow together with the ends of your thin ribbon. Step 10: Trim the ribbon to length desired and if you want to prevent fraying you can seal the ends with a naked flame. In the photos I've used satin ribbon because it stands out better for the purposes of photographing but satin tends to slip and pull and the bows fall out - organza works much better at staying put. Velvet would work well too.